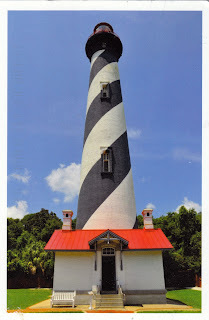 Postcard US-3866949 from Iowa shows the St. Augustine Light Station, located at the north end of Anastasia Island in St. Augustine, Florida. Built in 1874, it is an active, privately owned lighthouse and a not-for-profit maritime museum open to the public. Florida will help its presidential primary tomorrow on Tuesday March 15, 2016. Hillary Clinton and Donald Trump are the favorites to win their respective parties' nominations in the state according to the recent polls. Update on 3/15/2016: Clinton and Trump won decisively in Florida primary. Marco Rubio (R-Fla.) suspended his presidential campaign after a loss of almost 20 points to Donald Trump in Rubio's home state.